The weekend’s well earned victory, over a poor West Bromwich Albion team, brought joyous scenes to almost everyone inside the Liberty Stadium on Saturday afternoon and for the time being at least offered some hope for the relegation battle that lay ahead. A rare victory, inspired by captain Wilfried Bony’s thunderous 81st minute strike, prompted the Swans owners to inform the local media that Clement would be offered significant funds for the January transfer window – providing he can keep his team in the relegation dogfight. However, the visit of unbeaten Premier League leaders Manchester City on Wednesday is a sobering thought and without doubt the ultimate guide to seeing how good or bad Clement’s chances are of getting the promised cash to spend. Hopefully the club’s owners will invest heavily in the required players, such as a quality right back and creative midfielder or number 10. Failure to do so and we could well see the Jack Army looking at the Swansea betting odds for the Championship next season. Whether or not Clement will be given the money remains to be seen of course, but a glance over the Swans dealings in the previous six January windows, seems to indicate that neither the amount of money available or the quality of the acquisitions will be of great significance. Vangelis Moras – 30 year old defender, who was a free agent and was signed on a free transfer. Gylfi Sigurðsson – Loan from 1899 Hoffenheim. Josh McEachran – Loan from Chelsea. Roland Lamah – Loan from Osasuna. David N’Gog – Signed from Bolton Wanderers for an undisclosed fee. Adam King – Signed from Hearts for an undisclosed fee. Raheem Hanley – Was a free agent and was signed on a free transfer. Jay Fulton – Signed from Falkirk for an undisclosed fee. Marvin Emnes – Loan from Middlesbrough. Matt Grimes – Signed from Exeter City for an undisclosed fee. Kyle Naughton – Signed from Tottenham Hotspur for £5m. Jack Cork – Signed from Southampton for an undisclosed fee. Ryan Blair – Signed from Falkirk for an undisclosed fee. 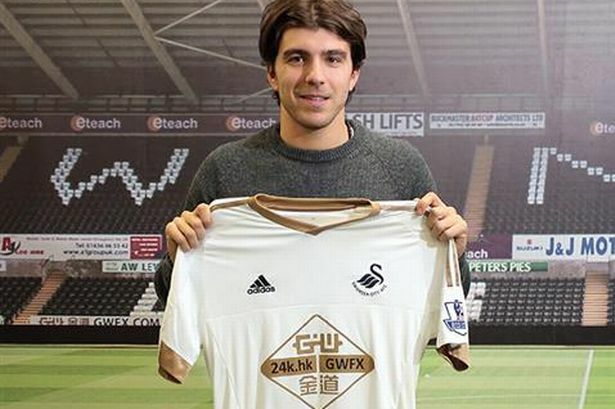 Alberto Paloschi – Signed from Chievo for £8m. Luciano Narsingh – Signed from PSV Eindhoven for £4m. Tom Carroll – Signed from Tottenham Hotspur for an undisclosed fee. Martin Olsson – Signed from Norwich City for an undisclosed fee. Jordan Ayew – Signed from Aston Villa for £5m and Neil Taylor in swap deal. Perhaps ironically it is Paul Clement whom appears to have had the biggest winter transfer kitty over the past 6 and a half seasons. Should this be the case come January 1st 2018, then the former Chelsea, Paris Saint-Germain, Real Madrid, and Bayern Munich coach is going to ensure he spends his money wisely. Otherwise the Premier League trapdoor will open further for Wales’ only Premier League team.